Three Sisterz: Thou Shall Covet: Wine Jugs? 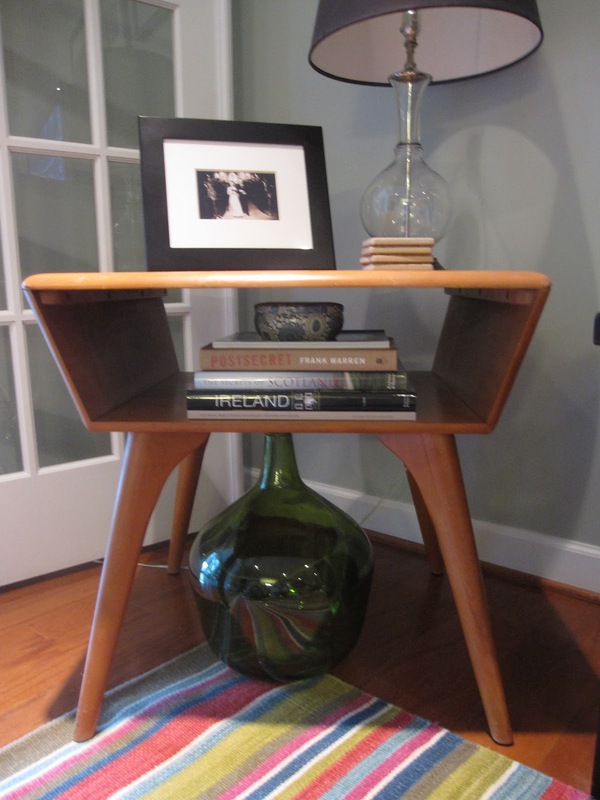 Thou Shall Covet: Wine Jugs? A lot of people have been inspired by Molly's wine cork wreath and the map coasters. Made me think about how much I love old wine jugs (and Friday happy hours). I love the shape and the color of the glass, the greeny-blue. Reminds me of sea glass and summer (and the end of the week). I like them so much, I've found ways to use them around my house. 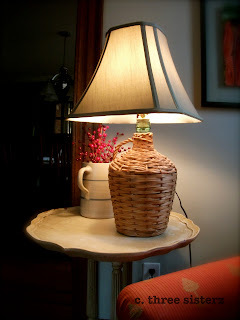 Take a look at this small wine jug that I thrifted and turned into a lamp. I may have creative ideas but sometimes when it comes to executing I have to call on Mimi (the handy mom to these sisterzzz). All it took was a lamp making kit, a pretty green shade from Target and voila! Nifty, no? This large wine jug Mimi thrifted for $3. I had to have it. We talked about making it into another lamp (we do call her the lamp lady after all) but it was just too big. So instead, we took some reeds from Home Goods and a pretty taupe grosgrain ribbon and made a nice piece for the corner of my living room. 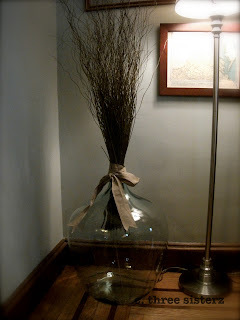 Looking for some similar pieces but don't have an old wine jug? 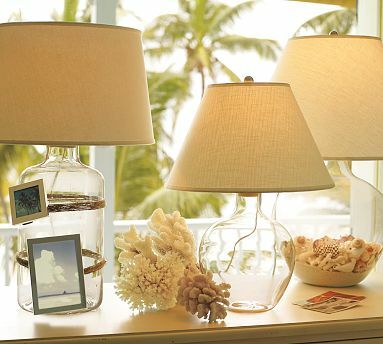 Take a look at Pottery Barn's Bacchus Glass Lamps. Aren't they pretty? Anybody else do anything interesting with wine-related materials? Do share! Clink!